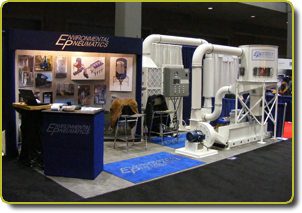 We are an engineering and manufacturing company specializing in the custom design, fabrication and installation of pneumatic conveying and dust collection systems for industry. We specialize in the recovery of waste product for the purposes of recycling and alternative fuels. The production and processing of paper, board, grains, steel and plastics create dust that may be hazardous and scrap materials that are recyclable or usable as alternative forms of energy. A pneumatic system will automate the removal of the dust and scrap products from the production area allowing the work area to be environmentally clean and the machinery to operate continuously without the constant interruption for manual cleaning. The air systems transport the waste to a separator where the air and the waste are separated and the product is baled or collected for re-cycling, or re-use as an alternative fuel. The filtered air is either exhausted to atmosphere or returned to the facility as allowable. In the corrugated, printing, and folding carton industries, the baled waste can provide a significant secondary profit center. When Environmental Pneumatics Inc. was founded it was our goal to make an impact on the industries we serve by following a very simple rule: Provide our customers with products and services that exceed their expectations. We accomplish this by taking the extra step, by asking the extra questions, and by never believing, that "good enough" really is. Environmental Pneumatics goal is to provide a system that accomplishes the customer's needs while at the same time being the most energy efficient system possible. The reduced energy will result in the most rapid return on investment. From conceptual design to the finished installation, Environmental Pneumatics system designs and solutions for our customer's problems have always been at least one step ahead of the competition. Environmental Pneumatics Inc. will work with each account to ensure that today's prospect is tomorrow's customer and to keep that customer satisfied. After initial contact and discussions, an EP Inc. sales engineer will visit the job site to evaluate your current operation and discuss your needs with the plant personnel involved with the project. Individual industries have specific applications that require different approaches to solve their scrap material disposal problems. Product and system engineers gather information at the job site. We research previous equipment applications and projects to develop the most effective means to address the client's needs. EP Inc. engineers and support personnel use state of the art Computer Aided Design and equipment to provide detailed documentation for project design, manufacturing and project management. All content is © 2011 Environmental Pneumatics, all rights reserved.